Tuesday, November 11 at 4:00 p.m. This faculty panel will explore the significance of the momentous events of 1989 in Eastern Europe and how they impact international affairs today. 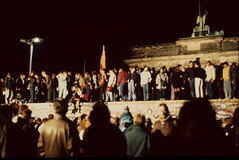 How has the meaning of the Berlin Wall changed over time? What lessons can we learn about the role of nonviolent political change and non-violent action? Have the West’s post-Cold War policies in the region contributed to the current Russian-NATO confrontation? Co-sponsored by the Kroc Institute for International Peace Studies and the Nanovic Institute for European Studies.